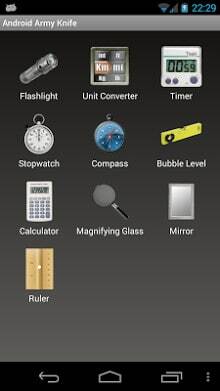 This app contains a set of tiny tools: a flashlight (widget too), a unit converter, a timer, a stop watch, a compass a bubble level, a calculator, a magnifying glass (Android 2.2+ required), a mirror (Android 2.3+ and front camera required) and a ruler. Essentially it is an Android “Swiss Army Knife”. Each tool does what it is supposed to do. There’s no space for special effects like 3d compass, talking level, psychedelic flashlight etc: the goal is to have a lightweight, fast and easy to use set of tools, one “tap” away from your home screen. 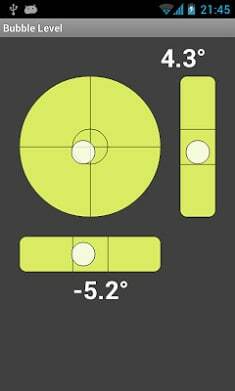 This app is half the size of a common “standalone tool” like a compass, a flashlight or a magnifying glass. This way you’ll save a lot of disk space. You’ll save network consumption too, not only for the first download but for every update too. It doesn’t require network access, the permission to write on your flash memory or the permission to read your contacts. If you find a bug, please contact us using the “Report a bug” main menu function. – The permission to use the camera is required in order to turn on the camera flash LED. Some smartphones (for instance the Google Nexus S) don’t light the flash LED if the camera is not running. If you check the most popular flashlight apps, you’ll find out that they all require this permission. Android Army Knife doesn’t shot any photos, doesn’t save multimedia info onto the flash card and doesn’t send anything on the internet: it doesn’t require the network permission at all. – This app was first released on may 2011 with the name “Swiss Army Knife”. Because of a copyright infringement it recently changed the name to Army Knife for Android.